I don't know about you, but most of the fragrances in my stash have definite personalities. So, by instinct I arrange the mild florals together, not far from the aldehyde-heavy fragrances, and then put the insistent florals on another shelf near the green chypres where they'll get along. The woody scents and leather hang out together not far from some of the vintage divas, and the 1980s blockbusters party by themselves on another shelf altogether. That way, bossy Paloma Picasso Mon Parfum doesn't scare the wildflowers out of the gentle Caron Fleurs de Narcisse, and Dana Tabu's trashy intensity won't freak out the happy-go-lucky Guerlain Chamade. Bois 1920 Sutra Ylang is one of the rare fragrances that could be at home just about anywhere in my perfume cabinet. According to Bois 1920's website, Enzo Galardi founded Bois 1920 in Florence, Italy in 2005 when he was inspired by formulae for Eaux de Toilette that his grandfather created in 1920. Galardi, who had begun studying perfume in 1985, launched Bois 1920 with eight unisex fragrances. 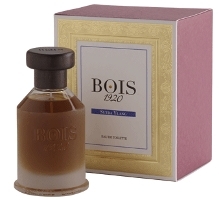 Bois 1920 has since added two fragrances especially for women. An aside on pronunciation: although Bois is spelled identical to the French word for "wood", at my local perfume shop they say that it is pronounced "boe (rhymes with toe)-EES". Sutra Ylang is one of Bois 1920's eight original fragrances. The Bois 1920 website only lists "hesperidic notes", sandalwood, and Texas citron as notes, but a quick search on the internet turns up a list of notes that sounds true to me: top notes of lemon, bergamot, cardamom, and bay laurel; a heart of rose, jasmine, violet, lily of the valley, and carnation; and a base of sandalwood, cedar, moss, and benzoin. All of Sutra Ylang is underlaid with the smell of wood. A little of the pencil shavings kick of cedar sets off sweet sandalwood and oakmoss for a combination as smooth and personable as Cary Grant. As Sutra Ylang wears on, it begins to sweeten very slightly and smell more like oranges, but it maintains an herbal, slightly musty smell that I love. Sutra Ylang lasts for hours, but has a tight sillage and might be blamed for wearing off quickly when really it has retreated to a few inches from skin. As a result, it's hard to overdo Sutra Ylang, and I like the feeling of abandon from being able to spray lavishly. In the end, Sutra Ylang is like the quiet guest at a party — the guest who enjoys listening to others talk, effortlessly pops open champagne, and mingles as easily with Wall Street types as he does with cashiers at the bodega. When you take the time to really pay attention to him, though, to appreciate his subtleties, you realize that this guy really has it going on. Bois 1920 Sutra Ylang is available in 100 ml Eau de Toilette. Although the list price is $160, I was able to purchase it for about $100 at an online discounter with a coupon code. For buying information, see the listing for Bois 1920 under Perfume Houses. Hmmm…If you had not written about Bois 1920 Sutra Ylang, Angela, I would not have given it a second thought…or a sniff. Kinda like that quiet overlooked, but very interesting, guy at the party. Oh, it sounds so intruiguing – like many of the line. But I don't manage to find Bois 1920 in any niche or mainsteram shop I know… and I do know many (it's my card replying)! Oh well, I've got so many lemmings already! p.s. your organized cabinet: LOL! Just like that quiet guy, I feel like Sutra Ylang needs some time to grow on you, too. I bought it almost unsniffed (I'd tried it in a store but didn't have a sample), and I thought “ho hum” at first. I mean, I liked it, but it wasn't very compelling. But it has really grown on me! Bois 1920 is kind of hard to find in shops, it seems. The website isn't very helpful, either–I wasn't able to get their “retailers” link to do anything but list countries. Oh well, if you stumble over it sometime, you'll know to give it a sniff. That’s great! I haven’t tried that one, but I will try it next time I’m at the Perfume House. I have only tried two from this line, Sushi Imperiale, which was nice, but not FB worthy for me, and Vetiver Ambrato, which I need to spray rather than dab to experience I think. Lately I am finding samples so completely unsatisfactory. I need to spray a fragrance, sometimes with wild abandon, to make up my mind! Well, maybe not a parfum, but you know what I mean. As for Sutra Ylang, I was interested that the heart notes, which are so classic, seem to yield completely to the top and base notes. It sounds like a lovely, slightly aromatic woody (semi-)oriental? I completely understand about sometimes preferring to spray a sample rather than dab it on, and I've had the same thought many times. You're right about the middle notes of Sutra Ylang, too. They might be there all along, but they're well enough blended that they don't make themselves known as rose, lily of the valley, etc. I'm usually just a reader on here but the coincidence of the timing of this review I think is worthy of mentioning. I spent the day xmas shopping at the mall. I always have to browse the fragrances. This evening I noticed the Bois 1920 line at Dillards and was actually partial to the lighter of the 2 juices I sniffed. By the time I got home I could not remember the name of either the house or the fragrance…sushi came to mind but I thought my mind was playing tricks on me. I gave up on trying to remember after I couldn't find the bottles on Dillard's website. I venture over here to check for some reviews of cologne for DH and the first thing I see is the bottle. Thanks for the review. I'll definitely be trying some of the fragrances from this line on skin soon. What a coincidence! You must have been thinking of Sushi Imperiale. Did you get the chance to try Sutra Ylang, too? This is right up my alley! Must find. And funny that you mention Cary Grant as I bought a bottle of Acqua di Parma purely because it was his favourite. I love it on summer days and as a linen spray. Wasn't this the one we encouraged you to buy that was “once briefly sniffed”? I smelled it in Harrods last month and have been wondering what your verdict was – it was a $100 bargain to celebrate your change in career direction, or something along those lines – please do refresh our collective memory! The name always made me think it was a ylang ylang prominent scent. I stand corrected. This sounds lovely. L, I warn you that it isn't a “blow you away” type of scent, but if you give it a chance, you just might get hooked. And Cary Grant is terrific! Yes, that's the one. At first I was a little disappointed, but now I reach for it all the time and find I don't get tired of it. Ugh! I'm sorry for your cold. I hope your sinuses clear up enough to enjoy a decent holiday dinner or two. I'm kind of puzzled by the Ylang, too. Maybe there is ylang ylang in it, and it does have the musty-clean impression of ylang ylang, but it smells more like citrus, bay, and dry wood to me. Nice to see this line FINALLY reviewed on NST. My fav of the line is still Real Patchouly. I got me my Dzing! though Ang…great call! Real Patchouly is a good one, too! I had a yen for a patchouli scent and debated between this one and Montale Patchouli Leaves and finally went with the Montale, but I still wonder if I made the right choice…. Tight sillage? I beg to differ. A coworker wears this gem of a scent and every time I smell it in the office I feel lucky that the scent travels so well, This is one of those fragrances that doesn’t suit my personality, but I’m glad to have someone around who wears it. Well, then, you just decided this morning’s perfume for me. I need to wear it again to test its sillage! It could be, too, I just wear less of it than your coworker does. In any case, thank goodness you like it!